We are supplying entire solution for Temperature & Humidity monitoring solution with software for hospitals, warehouses, furnaces,refrigerators, stability chambers etc. The solution involves one recorder, corresponding sensors for temperature and humidity with a software for recording and live viewing of the data. 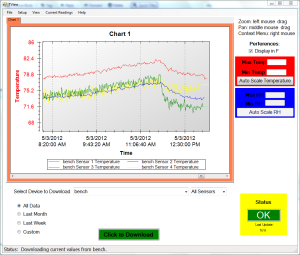 The data is automatically downloaded at predefined intervals to the PC. Also the same can be connected to the internet for online monitoring. As an additional option the software can send email messages upon any alert conditions either on lower or upper thresh hold levels. The monitoring instrument also has its own memory and backup which will continue saving in case of power failure. The system also makes phone call and SMS alerts for alert conditions. Multiple devices can be combined in a single graph.